International Journal of Research in Health Sciences,2013,1,2,88-95. 1Research Scholar, Department of Social Work, Kakatiya University-Warangal, Andhra Pradesh, INDIA. 2Chairperson, Board of Studies, Department of Sociology & Social Work, Kakatiya University-Warangal, Andhra Pradesh, INDIA. The primary interest of present study is to descriptive about street children situation in Tehran (Iran) and Hyderabad (India) cities. 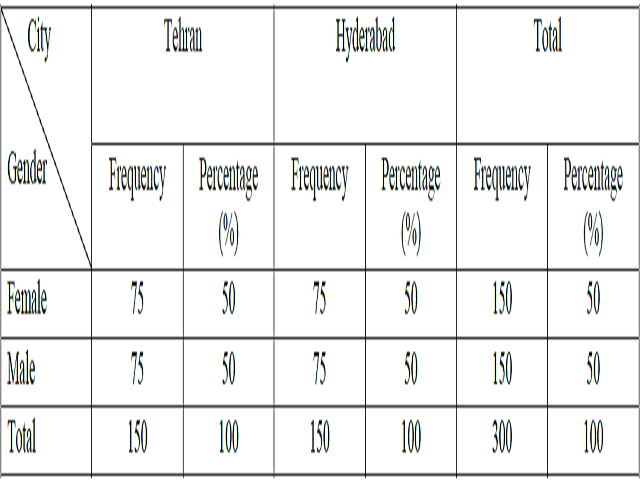 150 children (female=75, male=75) were selected based on the simple random sampling from rehabilitation homes in each city (150 children in Tehran and 150 children in Hyderabad) and the total of 300 children were involved in the study. Data was collected via personal and family information data sheet. Research findings related to respondents’ gender, age, educational level, experience as street child, father occupation, guardians, type of family, and reasons for leaving home presented by using the frequency distribution and percentage.